If you are a business that generates glass bottles and jars then recycling could be a cost effective option for you. Clearaway Recycling and Waste Management provides dedicated glass recycling services across Worcestershire , the Black Country and Birmingham. We provide easy to manoeuvre 240 litre and 360 litre wheelie bins emptied on a regular collection schedule. Reduces costs – Glass is significantly heavier than other general wastes and recycling will avoid the significant cost in landfill tax. Helps the Environment – the energy saving from recycling a single bottle will power a 100 watt lightbulb for almost an hour or a computer for 25 minutes. 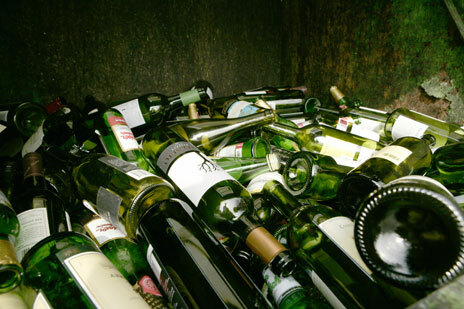 Reduces CO2 emissions – Every 100 tonnes of glass recycled saves 314 tonnes of CO2. Conserves the landscape – Recycling glass saves the extraction of sand from quarries conserving our natural resources.